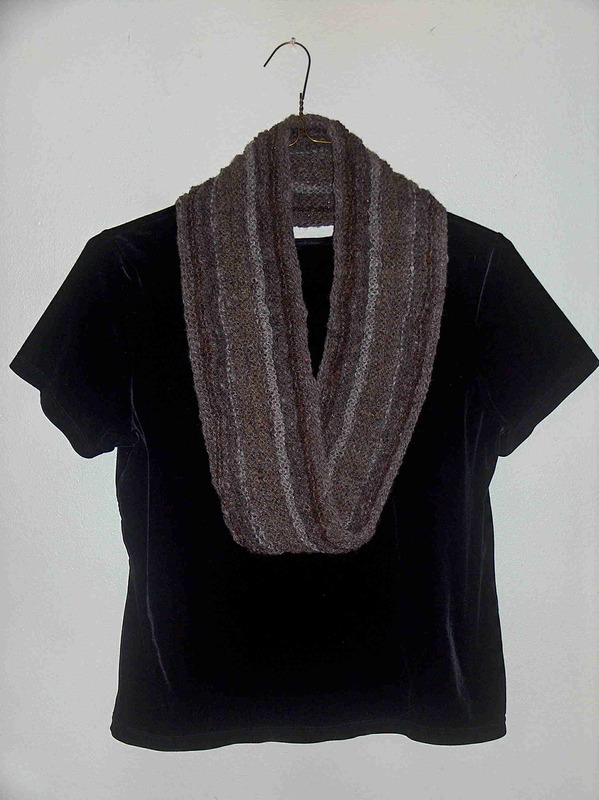 In April 2008, I knitted my first Moebius scarf and was immediately hooked. (Remember the Moebius band we learned about in math class? Give a long strip of paper a half twist, then join the ends with tape. The result is a one-sided, one-edged object. Test it: Put a dot on one side of the strip at the taped edge then run your finger along the edge. It will first meet the tape on the side opposite the dot, and later will return to the dot, even though your finger stayed on the edge the whole time.) 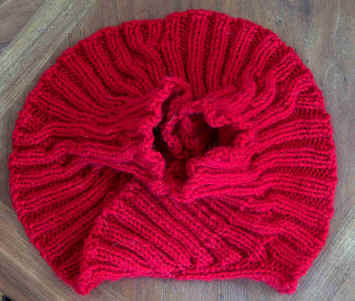 Moebius knitting is the most fun you can have with the craft! The Moebius scarf at right (the twist is at the fold at the bottom) is sheep-to-scarf: I spun wool from a fantastic sheep named Big Mama, who was grazing in Towanda PA at the time I received the fiber (she now lives an hour from there with a new owner). All the colors in the yarn were those of Big Mama’s; none came from dye. The scarf now belongs to Big Mama’s former owner and new fiber friend, Catherine Veleker. Perhaps I will someday attempt 15 half twists. 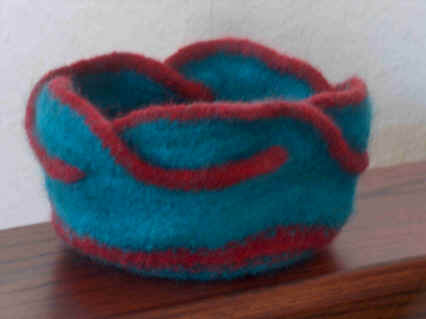 Anyway, I hope you can understand how much fun Moebius bowls are to make. 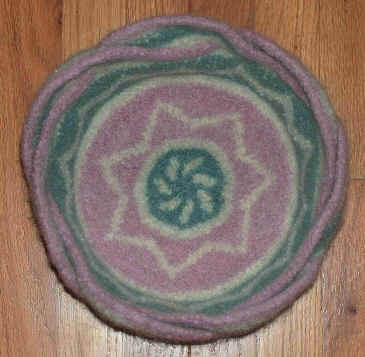 And because they are felted, you never really know what the end result will be until each one comes out of the washer. Feel free to leave a comment about what you see. 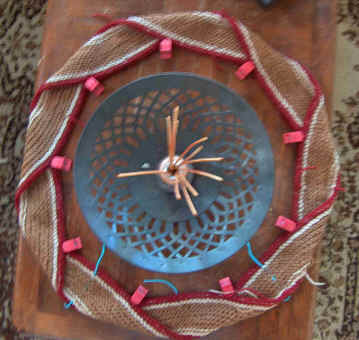 The cabled scarf led to a ribbed cowl sporting diagonal ribs. Here is the cowl viewed from the top. When I folded it along one of the diagonal ribs (left photo) and flipped it over, the diagonal ribs disappeared (right photo). Yikes! Is this a two-sided Moebius collar? 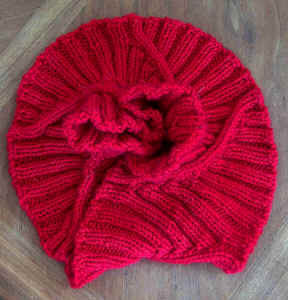 It was knitted as a one-sided object! 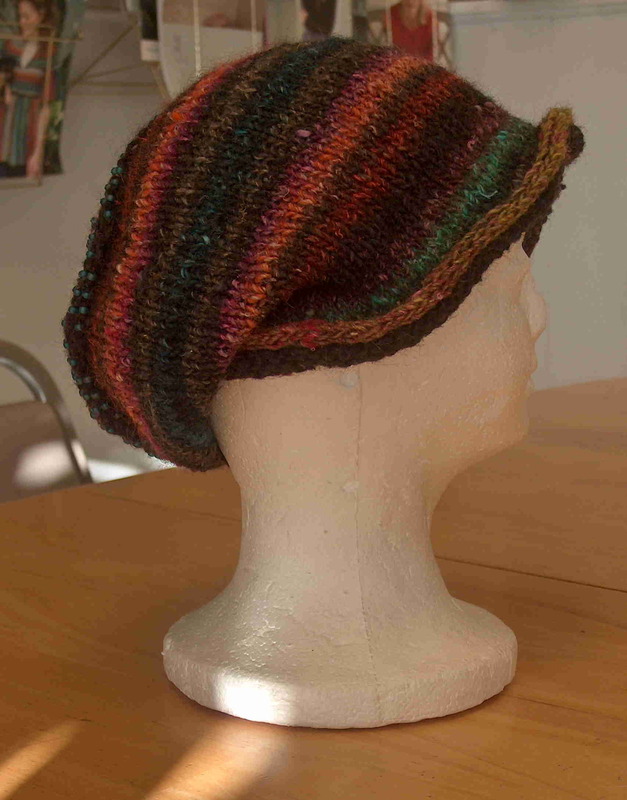 How about a Moebius hat? Yup, it’s one-sided. Dizzying, isn’t it? 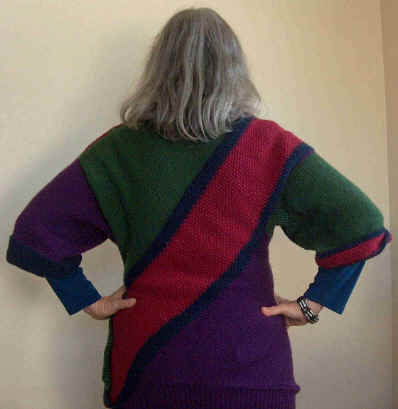 Oh my, a ONE-SIDED sweater? Well, not quite, but it sure was fun to try this. 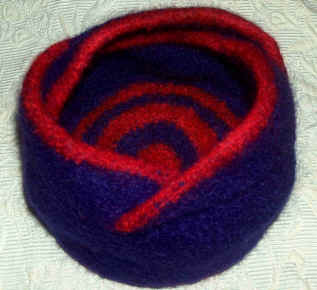 The red and navy diagonal stripes are a Moebius band. Note a smaller Moebius band as one of the sleeve cuffs. 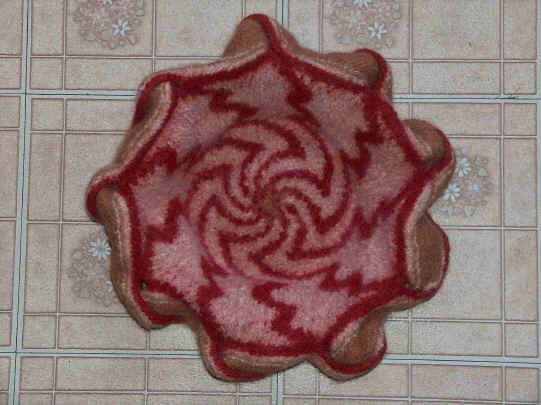 A little history: I began knitting my first sweater from scratch on Sunday October 4, 2009. (I’d just had major eye surgery and was bored to tears. Not sure how I did this with terrible vision in one eye.) No pattern, no sewing, just a gauge and a chest measurement and then several percentages of the latter; it was a plain V neck with long sleeves. 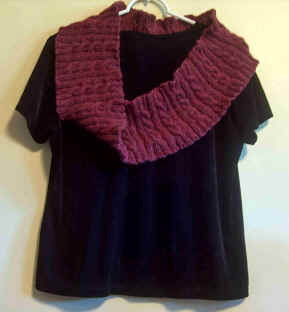 #2, now with the help of Knitting in the Old Way, by Priscilla Gibson-Roberts with Deborah Robson, was a sleeveless vest for my husband. 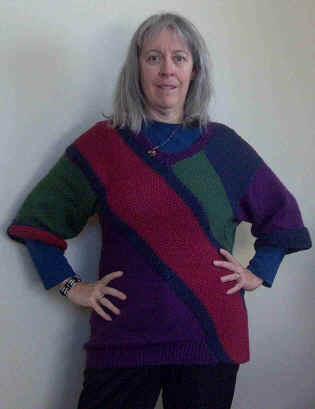 This sweater is #3, testing the percentages and the waters for knitting on the bias. What can I say? The system works! I have another Moebius sweater in mind.